The plated fiberglass hull is the base for this model, along with the superstructure from computer printed 1mm plastic for the main assembly and a sheet of .5mm printed plastic adding the final sharpness to this elegant model. To add all the detail over 100 fittings cast in light alloy or plastic are included in the kit. Vacuum formed plastic moldings take care of all the larger and more complex parts such as the many ships boats, funnels, vents and funnel bases. The many stanchions on this model are cast in light alloy to give the correct pattern of spacing, with 2 gauges of brass wire for the stanchion wires. Brass etched ladders add the finest detail and delicate touch to this model, one of the classics among warships. A comprehensive instruction book is included in the kit keyed to TWO FULL SIZE PLANS. As in all the kits in the range, a full set of running gear is included in the kit. 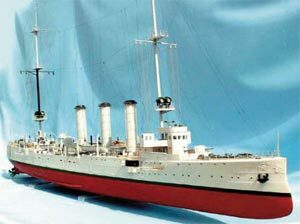 To add to the classic look of this ship the color scheme east India station is included along with tips in the instructions for the use of the modern ACRYLIC car spray paints that are giving such outstanding results.